The average person may know very little about the life cycle of flowering plants, even though flowers have been used as symbols, medicines, ceremonial aids, and decorations worldwide, and captivated even the hardest of hearts with their beauty. Various parts of flowering plants are also used as food. If you're starting a garden or curious about where the food or flowers on your table come from, this information will be helpful and interesting. To view and print the entire life cycle above, use a PDF program like Adobe Reader. Match the corresponding image in each section, like the vegetative section, to its position in the entire cycle. 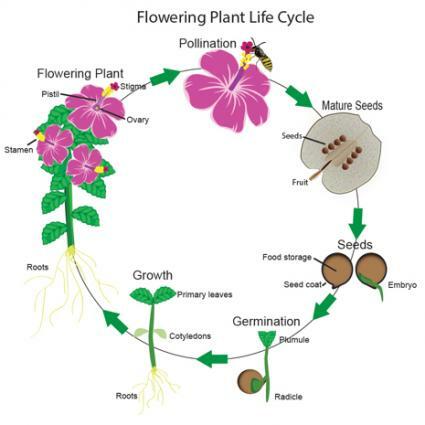 In the first half of a flowering plant's life cycle, a seed grows into a pre-flowering plant. Seeds come in various shapes and can range in size from nearly invisible (in the case of tropical orchids) to quite large (like avocados or coconut palms). 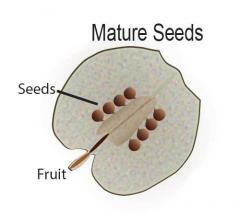 Every seed contains an embryo, or a miniature version of the plant, ready to sprout and grow when conditions are right. In addition to the embryo, seeds also contain food for the plant to begin its journey, the beginnings of a root structure, and a protective outer shell called the seed coat. Some seeds, such as the lotus, can lie dormant for many years and still sprout when conditions are right. Others, like some annual grasses, must sprout within a few weeks. When conditions are right, the seeds germinates, which means it begins to grow. While different seeds require different conditions to germinate, seeds generally require water and warmth. Some seeds also require light, others must go through fire or even the digestive tract of an animal to begin their germination. Germination begins when, under the right conditions, the seed absorbs water and swells, breaking the seed coat. 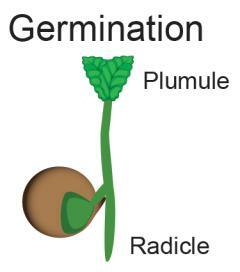 It then grows a tiny root called a radicle which anchors the plant and absorbs water. With this in place, it sends a shoot (plumule) that eventually sprouts above ground. When this happens, it is called a seedling. 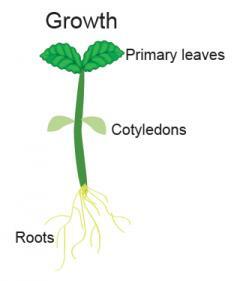 The first leaves of the seedling are called cotyledons. These are actually not proper leaves, but nutrient stores that were present in the seed with the embryo. These nourish the plant as it develops the capacity to harvest nutrients from its environment. Some plants, called monocotyledon, have only one cotyledon while others, called dicotyledons, have two. The plant then begins to develop its first proper leaves, called primary leaves. These leaves start the process of photosynthesis, or turning the energy from sunlight, water, and carbon dioxide into sugars which the plant uses for food. The plant does this by using chemicals called chloroplasts. Many plants continue to grow upwards and form new leaves at the top of the stem (meristem), as well as downwards, growing more root hairs. This growth increases the amount of nutrients it is able to gather and helps it withstand weather, disturbance from animals, and competition from other plants. 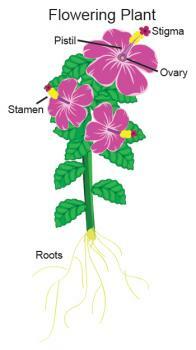 In the reproductive stage of life, the plant flowers, is fertilized, and produces seeds. In the beginning of the reproductive stage, the plant grows a small bud. Inside the bud, a tiny flower begins to form, protected by the surrounding sepals. Eventually, the bud opens to reveal a mature flower which is the reproductive part of the plant. Flowers usually have brightly colored petals or strong scents to attract pollinators. 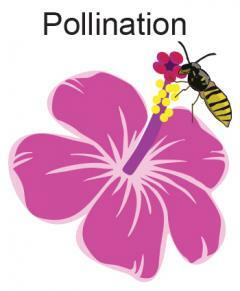 Pollination occurs when the pollen from the male anther is transported to the female stigma. Some plants can self-pollinate. Others require insects, wind, rain, birds, and other natural processes to transport the pollen. Plants can also cross-pollinate, which means pollen from one plant is taken to another plant of the same species. This is beneficial because it creates genetic diversity, which makes the subsequent generations stronger and more adaptable. Insects like bees play an important role in pollination, pollinating plants as they collect pollen for their food. After pollination, the seeds become reproductively viable. A protective layer, called the fruit, forms around the seeds. Some fruits are large and fleshy like an apple, others are dry like the white parachute of a dandelion. Seeds can be dispersed in diverse ways. The simplest way is to fall to the ground. Many are eaten by birds animals and transported in their digestive tracts. Others, like burdock, are structured to stick to passersby. Still others, like dandelion, float easily on the wind over long distances. The goal of all plants is to create new viable offspring through seed dispersal. Once the seed arrives at a place where it can germinate, the life cycle is ready to begin again. While the general process may be similar, some flowering plants do reproduce via other methods. Forming new bulbs - Plants like garlic, which grow from bulbs, produce more bulbs at maturity from which new, independent plants grow. Runners - Strawberries, for example, send out runners along the ground along which nodes form. Each node has the opportunity to grow into a full plant with a root system, leaves, and reproductive capabilities. Strawberries also use sexual reproduction. Tubers - A potato is actually a tuber which is the part of the plant used for vegetative reproduction. The tuber forms sprouts, then these turn to stolons, which shoot out laterally underground and form new tubers. Suckers - Banana trees reproduce simply, by growing a new stalk at the base of the existing stalk. This new stalk is called a "sucker." Corms - These root-like structures are clumps of cells from which plants grow. Each corm forms new corms and reproduces vegetatively in this manner. Saffron is one plant that reproduces this way. Leaves - Some plants, such as begonias, form adventitious buds on their leaves. When the buds come into contact with the soil, they grow roots and take on a life of their own. Different plants complete their life cycles at different rates. Annuals complete their life cycle in one year or less (corn, dandelions). Biennials complete their life cycle in two years, often storing up energy in their rootstock over the winter and shooting skywards in the spring of their second year (beets, burdock). These plants usually begin the reproductive part of their life cycle in their second year. Perennials live for many growing seasons. Many produce seeds with each season after they have reached maturity (blueberries, purple cone flower). Flowering plants each have unique variations in the ways they grow, bloom, and reproduce. The best way to learn about the life cycle of flowering plants is to observe it in person. Watch for the different stages of the life cycle in your garden or in common weeds and observe the differences you see. Try recording what you observe in a journal. No matter how much you study it, though, the life cycle of flowering plants never loses the magic and mystery that is present in all living things.